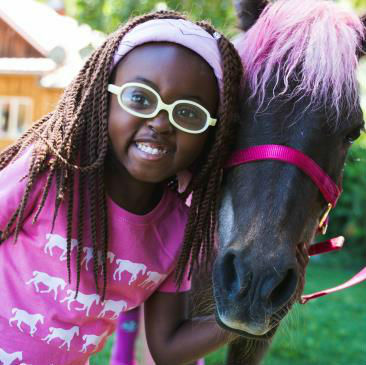 Carmel is a sweet, extroverted, and people-loving 4-year-old little girl who also loves horses, panda bears, and spending time outdoors. Oftentimes, people who know Carmel refer to her as being “Carmel Strong,” for good reason. Carmel lives with a very rare genetic and neurological disorder called, “Alternating Hemiplegia of Childhood,” or AHC for short. This disorder is progressive (which means that it gets worse as time goes on), and is so rare that only one in one million people are affected by it. There is no cure, and very little treatment that is effective in preventing the pain and episodes of partial to full paralysis that AHC can bring at any given time. These episodes can last anywhere from five minutes to as long as several days. Because of this, it is hard for Carmel and her family to know what her life will be like from day to day. In addition, Carmel suffers from seizures, due to epilepsy, and has trouble swallowing (known as “dysphagia), along with gastroparesis (paralysis of the stomach that does not go away.) As a result, Carmel receives nutrition and hydration through a feeding tube. Carmel also has experienced significant brain damage and her overall condition has caused a delay in her speech development. Carmel wears glasses, braces on her legs and feet, and depending on how she is doing, uses a walker or a wheelchair to help her get around. Carmel has between 7-10 medical and therapy appointments per week, and will soon be having surgery to install another permanent tube in her stomach. In spite of all of this, Carmel is full of life and her spunky personality and great sense of humor draw people to her wherever she may be. Carmel will be adopted as a Sparrow to St. Monica Catholic School in Mercer Island, WA. St. Monica students will work hard to raise money for sweet Carmel through sponsored community service and fundraising projects.